Hunting – profit or loss for SA? The American Library Association stated that school shootings, bullying and child abuse occur most frequently in areas with highest hunting participation and with most lax gun regulation, and removed books with stories about hunting from their recommended reading lists country-wide. Welfare workers in South Africa during Kader Asmal’s term of office were concerned that when children practice cruelty towards animals, this played out in their behaviour towards their peers, and, left unchecked or unpunished, was one of the three major contributing factors to psychopathic behaviour in their young adulthood. 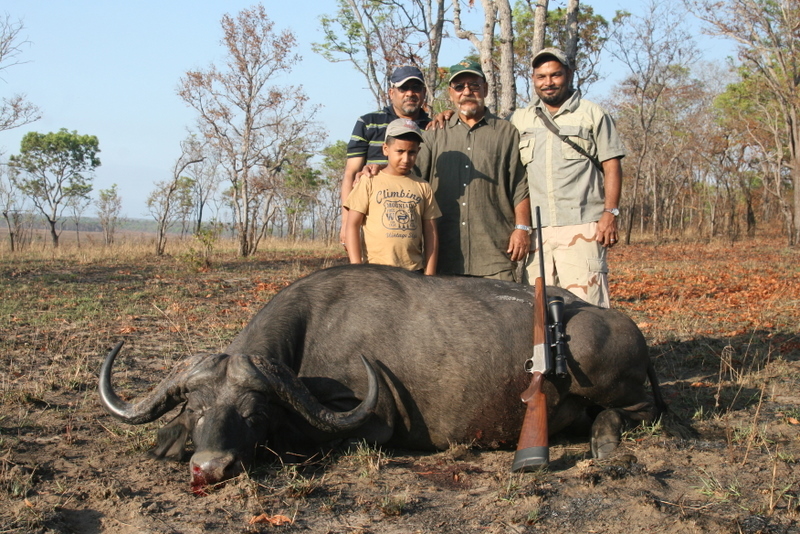 Parent’s condoning hunting and ritual slaughter were cautioned that their children may grow up to be high-violence-contributors. The Humane Education Trust was established. Hunting is an elitist activity as well as a cruel one and has been radically phased out North America and Europe. Children are aware of this and discuss these issues. I’m sure that neither you nor I, who work vocationally towards South African children’s future want them to one day be ashamed that they grew up in a non-progressive society, but rather to reflect back on our influence and see us as the foundations of the progressive society they inherit. Beauty Without Cruelty not only raised the issue of the questionable idea of instilling in school children of any age that hunting is an acceptable and indeed praiseworthy pastime, BWC also, with the assistance of Aquila private game reserve, offered an alternate prize, of a luxury safari viewing weekend for four, in lieu thereof. 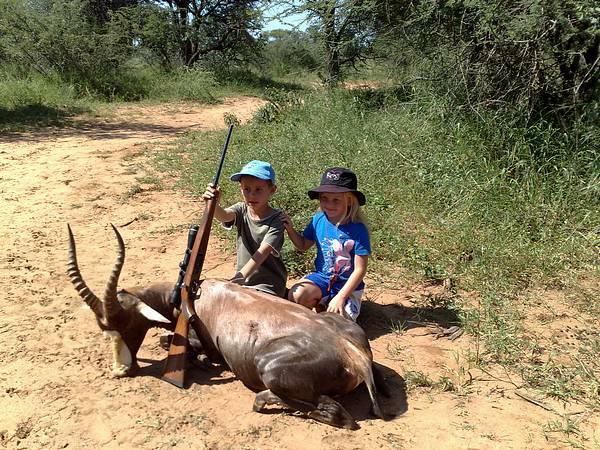 This was refused by the school head, (after ignoring e-mails) via telephone, because they see nothing wrong at all with the idea of a weekend of animal killing instead of animal viewing, poo poo’ing the concept of animals shot with cameras and not weapons. BWC is against the idea of taking lives for pleasure, profit or palate, especially in an age and area where various healthful foods are in abundance. The simple fact is that hunters enjoy killing. ‘For the pot’ is an excuse for legal killing. That this is legal and considered acceptable, as we know, does not make something ethical or moral. Hunting protagonists would have you believe that hunting benefits South Africa by creating jobs and bringing in money. For example, the Dept of Environment recently told the media: ‘In 2012, the income generated by trophy hunting from fees and daily rates was about R807 million.’ It astounds me how uncritically African governments accept that hunting is an economic and employment benefit to the country. The claim that hunters create jobs and income requires us to assume that all the hunting farms were vacant land before being used for hunting. That is simply not true. All those ten thousand hunting farms in SA used to provide jobs for workers to produce crops and livestock. All those farms used to provide for the nation. Now they produce living targets for the hunting industry. Is this progress? Let us take the wool industry, for example. We know that the amount of wool produced in SA over the last 20 has declined by 50 000 000 kg. (Fifty million kilograms) Let’s break that figure down. Taking an average flock of a 1000 ewes, that means a loss of 12,500 farms. Notice how that correlates to the increase in hunting farms to more than ten thousand. Each unit could give 4000 kg of wool a year and employ three workers. So converting to game farming (hunting) has resulted in the loss of more than 37,000 jobs in the wool industry. Some of these would have gone to the game industry but not all – the skill set is different. Many of the so- called game or holiday farms do not have any employees and are only used for a weekend get away, and for hunting. While this spoof website is humourous, the fact of the matter is that hunters enjoy killing, and yes, could be seen to be attempting to compensate for real or imagined inadequecies. All the pro-hunting arguments about conservation, damage causing animals, the the thrill of the stalk and the like comes down to one simple fact. They like killing. Or they would use cameras. This article in Psychology Today provides some insight about the Trump sons and other trophy hunters. Before you support a “wildlife” or “conservation” group, ask about its position on hunting! It isn’t possible to even articulate what impact this picture has. In a 2003 paper in the journal Visual Studies, two sociologists reviewed hundreds of photos in 14 popular hunting magazines, looking for themes in the photos of animal bodies. They tested the notion in traditional hunting narratives that trophy displays pay tribute to the beauty of nature and wildlife. Instead of love and respect for nature and individual animals, the researchers reported, we found extreme objectification of animal bodies, with severed deer heads and cut-off antlers representative examples of the contradiction in the love-of-nature hunting stereotype. These days, whether one actually displays heads on walls or instead has photos of oneself grinning like a buffoon over the corpse of the dead animal, is irrelevant – both clearly indicate people who kill for entertainment or to gratify their egos. 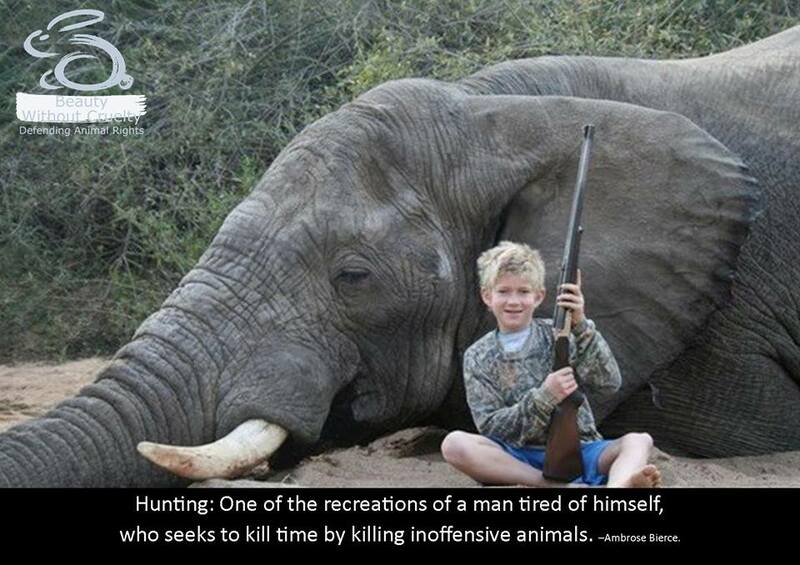 People who kill for fun are usually labelled serial killers. Contrary to what hunters often say in defense of their cruel pastime, hunting has nothing to do with “conservation” or “population control.” In fact, animals are often specially bred and raised for hunters to kill. If left unaltered by humans, the delicate balance of nature’s ecosystems ensures the survival of most species. Natural predators help maintain this balance by killing only the sickest and weakest individuals. This article written some years ago by local Gareth Patterson makes for compelling reading: hunting is a series of killings. Yes, hunters are usually within the law, coming from familes where hunting is an acceptable activity. 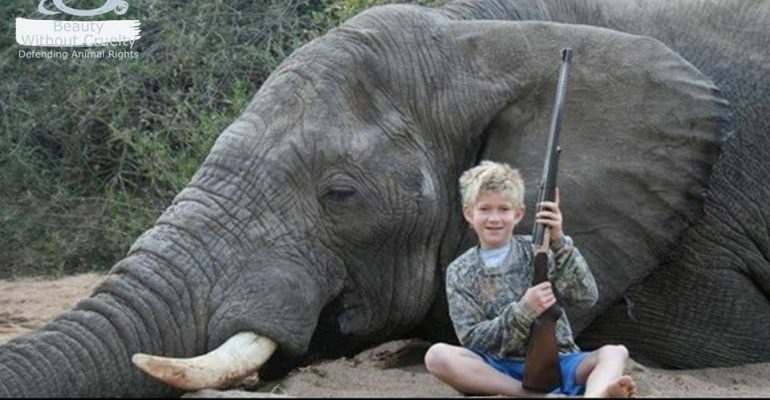 To our view, taking children to hunt, active particpants or not, is akin to child abuse. How many parents take their children to an abbatoir? (Although that is a discussion for another page) However, unlike murdering humans, hunting is considered by many to be socially acceptable , just like so many other forms of animal exploitation. It seems clear the feelings of power, dominance and attention -seeking in hunters and serial killers are similar. 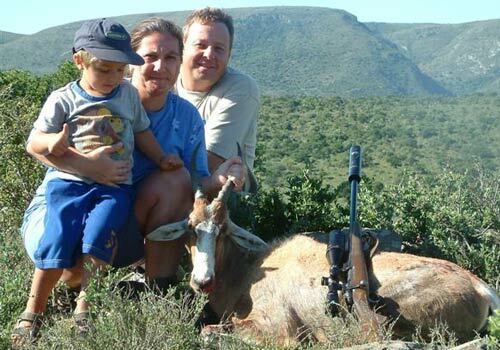 Seen on a hunting website : We encourage family hunts and teach the young ones at an early age to participate. This young lad does not look happy. This excellent article written by James McWillians June 2013 is worth a read, on the mindset of the big game hunter. The trophy hunting of lions Panthera leo is contentious due to uncertainty concerning conservation impacts and because of highly polarised opinions about the practice. African lions are hunted across at least ~558,000 km2, which comprises 27–32% of the lion range in countries where trophy hunting of the species is permitted. Consequently, trophy hunting has potential to impart significant positive or negative impacts on lions. Several studies have demonstrated that excessive trophy harvests have driven lion population declines. There have been several attempts by protectionist non-governmental organisations to reduce or preclude trophy hunting via restrictions on the import and export of lion trophies. We document the management of lion hunting in Africa and highlight challenges which need addressing to achieve sustainability. Problems include: unscientific bases for quota setting; excessive quotas and off-takes in some countries; fixed quotas which encourage over-harvest; and lack of restrictions on the age of lions that can be hunted. Key interventions needed to make lion hunting more sustainable, include implementation of: enforced age restrictions; improved trophy monitoring; adaptive management of quotas and a minimum length of lion hunts of at least 21 days. Some range states have made important steps towards implementing such improved management and off-takes have fallen steeply in recent years. For example age restrictions have been introduced in Tanzania and in Niassa in Mozambique, and are being considered for Benin and Zimbabwe, several states have reduced quotas, and Zimbabwe is implementing trophy monitoring. However, further reforms are needed to ensure sustainability and reduce conservation problems associated with the practice while allowing retention of associated financial incentives for conservation.